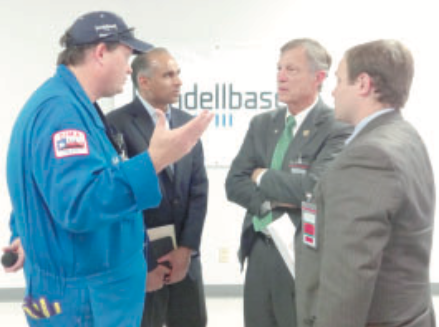 Congress Babin visits the LyondellBasell Channelview Complex last week. Left to right – Todd Monette, Channelview Site Manager; Bob Patel, LyondellBasell Chief Executive Officer; Rep. Brian Babin (R-TX); Kelly Waterman, Rep. Babin District Director. 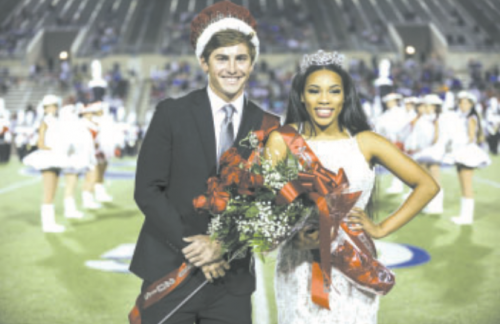 CHANNELVIEW –Sept. 23, 2015 – Employees from the LyondellBasell Channelview Complex hosted a visit by Congressman Brian Babin (TX-36). The congressman and his staff were briefed on the plant’s operations and met with LyondellBasell CEO Bob Patel, Executive Vice President of Intermediates and Derivatives Dan Coombs, site leadership and other employees. Congressman Babin received a tour of the facility to learn more about daily operations at the site before engaging in a town hall meeting with workers from the facility. U.S. Rep. Babin represents more LyondellBasell facilities than any other member of the U.S. House of Representatives. His district includes Channelview, Bayport, La Porte and the Mont Belvieu terminal for the Company’s pipeline group. North Shore Homecoming King and Queen, Andrew Pouland and Chardon Mucker. Society. He is head rounder for the Mustang football program and a student section leader. Pouland is ranked ninth in his class with a GPA of 4.4 and plans on attending Texas A&M University majoring in biomedicine. Chardon is a vital part of North Shore’s girls track team, national honor society, and the national society of high school scholars. After graduation she plans to major in criminology and run track. 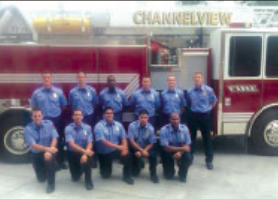 The Channelview Fire Department has entered a new phase of service to the community, and is now staffed with 100% paid firemen and EMS personnel. There are currently 75 men and women on the staff. Average response times are 5 minutes, as the trucks are staffed full-time 24/7, with 15 persons always on duty. The department runs 2 fire trucks, and 3 ambulances, as well as a District Chief and EMS supervisor. Emergency Service District #50 is responsible for the finances of the department. Expenses for the department are paid with tax funding and EMS billing. Equipment includes two active pumpers, a ladder truck, a back-up pumper, a brush truck, and four ambulances. Back-up equipment includes another pumper, and an ambulance. The department was founded in 1949, chartered in1953, and in 2012 transitioned into a full paid department regulated by the Texas Commission on Fire Protection. ESD#50 was established in 2003. Channelview Fire Department serves about 38,000 people in a 16+ square mile area. It’s success is built on its long history, the work of its predecessors, support of the community, and the commitment of the present men and women.